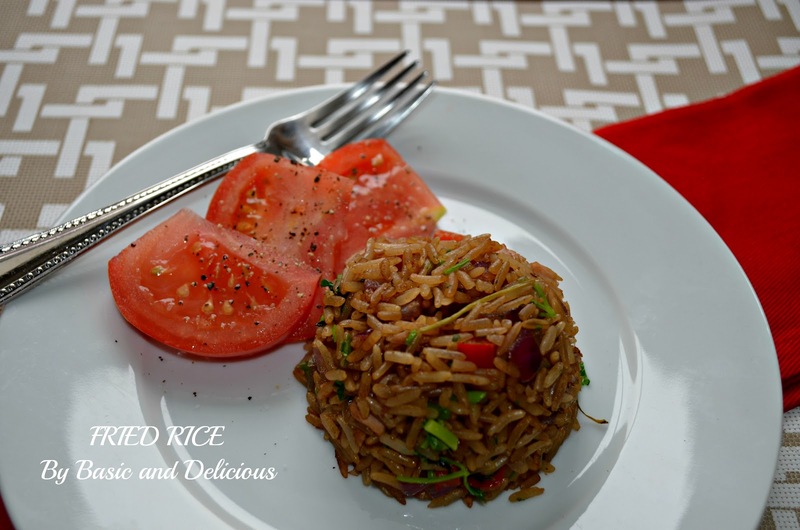 This is a great option to use the rice that was made before, and one of the quickest ways to prepare lunch or dinner that will delight the whole family. These days we look for recipes with few ingredients that facilitate the day and not have to spend hours cooking, and a delicious flavor that will surprise you. Not forgetting that is low in fat. The fried rice is delicious and you can vary the ingredients the way you like most, you can even make it completely vegetarian, if that’s the case. Make this recipe for your family and surprise them with a new way of eating rice and maybe will become the favorite. In a hot skillet spray with cooking spray and add the onion and red bell pepper, cook for 5 minutes, add the ham and stir. Add rice and mix well, add the soy sauce and Worcestershire sauce, stir well until everything is completely incorporated, add salt and pepper. Remove from heat and sprinkle the cilantro, serve with salad. Esta es una excelente opción para utilizar arroz del día anterior, y una de las formas mas rápidas de preparar un almuerzo o cena que encantara a toda la familia. Y en estos días buscamos recetas de pocos ingredientes que nos faciliten el dia y no tengamos que pasar horas cocinando, lo mas importante es su sabor delicioso le sorprenderá. El arroz frito es delicioso y puede variar los ingredientes de la forma que mas le guste, hasta puede hacerlo completamente vegetariano, si ese es el caso. Haga esta receta para su familia y vera como les encantara, una nueva forma de consumir el arroz y puede ser que se convierta en la favorita. En una saten caliente rocie con spray de cocina y agregue la cebolla y el chile dulce rojo, deje cocinar por 5 minutos, agregue el jamon y revuelva. Agregue el arroz y mezcle bien, incorpore la salsa de soya y la salsa worcestershire, revuelva bien hasta que todo este completamente incorporado, agregue sal y pimienta. Retire del fuego y rocie el cilantro, sirva acompañado de ensalada. This entry was posted in Uncategorized and tagged fast, Lunch, rice by Kathia Rodriguez. Bookmark the permalink.